Where else can you have some fun at the Deserted Fairground? The rigged fair Coconut Shy is where you can pay Leeroy the Quiggle 100 NP to throw a ball at (and try to knock down) a coconut! If you miss it you get no prize! If you hit it, but it barely moves, you get 50 of your neopoints back. If you almost knock it down, but it just wobbles, you get 300 neopoints. 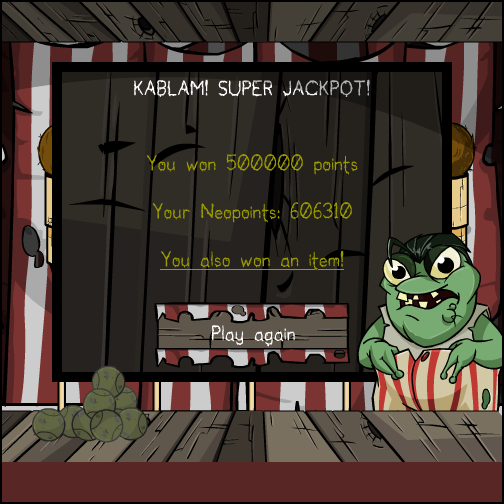 If you do knock it over, you get a whopping 10,000 neopoints and an Evil Coconut (see below), which can be worth a LOT of neopoints. You'll also receive the avatar. This is a game of luck so your result is random; even if you do manage to hit it there is no special technique to knock it down. Also note you are limited to 20 throws per day, so make them count! It is possible to knock down a coconut more than once in a single day if you are extremely lucky. 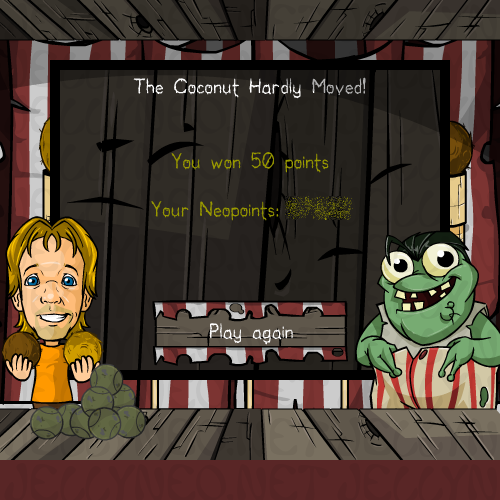 Here is a complete list of the coconuts you can win by playing this game. The Flaming Evil Coconut, contrary to appearances, is not obtainable from this game. Here's what it looks like when you manage to explode a coconut. Thanks to TerriH for this screenshot! You can get Mr. Chuckles as a challenger by refreshing at the Coconut Shy. Click Here For More BD Challenger Information! Like some other games on Neopets, Ollie makes an appearance at the Coconut Shy stand! After throwing your ball at a coconut, click the right eye of Leeroy the Quiggle (technically his left eye) to make Ollie appear for a short while. I was only able to summon Ollie after Leeroy performed his signature "kick while laughing" taunt, which is not to be confused with his "point while laughing" or "stare unblinkingly while laughing" techniques. Want to see all the games that Ollie appears in? To The Phantom Orange Shirt Guy article!